CSCS is operating an HPC system for the Swiss Institute of Particle Physics (CHIPP), which is used to analyze the data from the Large Hadron Collider (LHC) experiment at CERN. CSCS asked CHIPP to organize an internal one day workshop to present the physics, the experiments and the accelerator at the LHC as well. The morning session was mostly dedicated to a general introduction of the LHC experiment and particle physics. 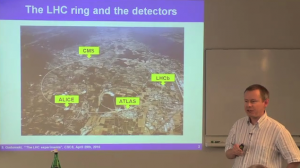 The afternoon session was dedicated to a description of the experiments (CMS, ATLA, LHCb) that are relevant for CSCS. CSCS has been impressed by the presentations given by CHIPP collaborators. 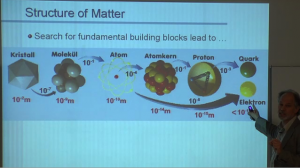 In a very clear way they introduced us to the world of particle physics and of modern colliders and detectors. We are very happy and honored to be able to share with you the recordings of the presentations. They give us an insight in one of the most challenging experiments ever done on Earth, with the largest instrument created on this planet. We start by publishing the first three introductory presentations of the morning that give an impressive overview on LHC and particle physics. You have in any case to have a look to the first presentation of Prof. Christoph Grab (ETH Zurich) introducing us in the world of particle physics. 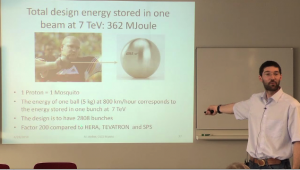 Then Szymon Gadomski (University of Geneva) explains the LHC experiments and their properties. Finally Michele Weber (Laboratorium für Hochenergiephysik-Universitaet Bern) explains what accelerators are and how they work. To view the presentations you need Quicktime. Just click on the picture or follow the link underneath for download options (e.g. for you iPhone).